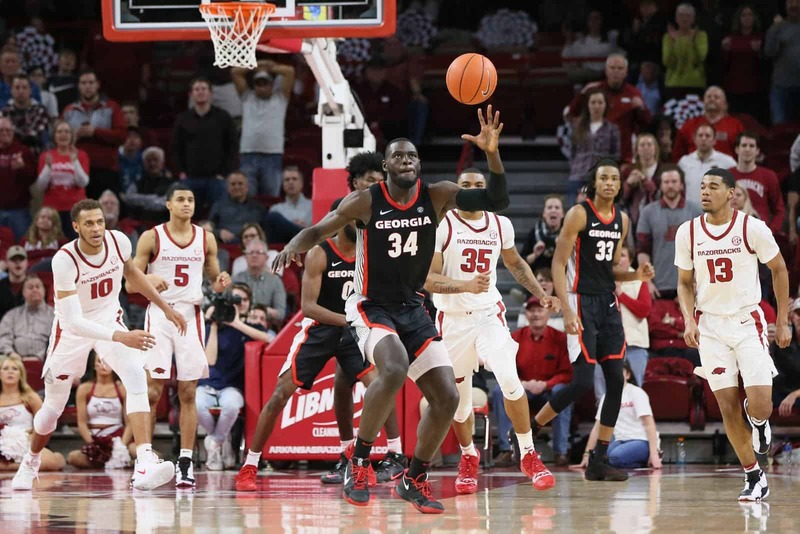 FAYETTEVILLE, Arkansas – The Georgia men’s basketball team dropped its third Southeastern Conference road game of the season with a 70-60 loss to the Arkansas Razorbacks Tuesday evening at Bud Walton Arena. 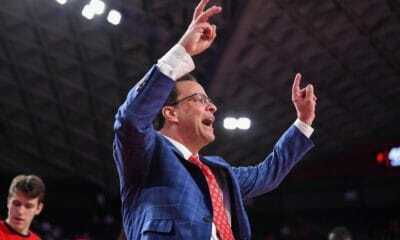 The game featured seven ties, seven lead changes and the only double-digit lead occurred in the final minute. The Bulldogs held the lead for the most amount of time at 18:12 compared to Arkansas’ 17:39, but the Razorbacks, the SEC’s sixth-best scoring offense, led a vast majority of the second half. Shooting went in the Arkansas’ favor, going 25-for-61 for a shooting clip of 41-percent as Georgia shot 19-for-61 for just 31.1-percent. 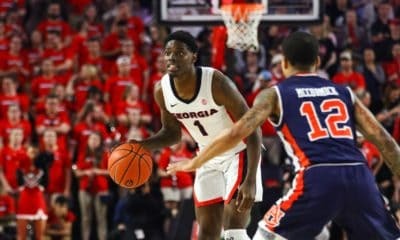 Georgia dropped to 10-10 on the season and 1-6 in SEC play, while Arkansas improved to 12-8 and 3-4 in conference games. 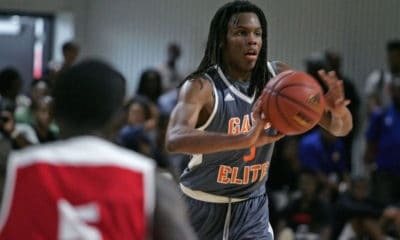 Forwards Rayshaun Hammonds and E’Torrion Wilridge grabbed 13 and 10 boards, respectively, en route to Georgia owning the rebound battle, 54-30. Offensively, forwards Nicolas Claxton and Derek Ogbeide led the Bulldogs in scoring with 14 points apiece plus 11 from senior Turtle Jackson. 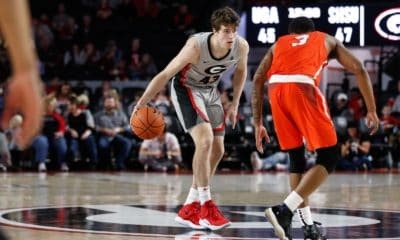 Georgia left points at the free-throw line with a 15-of-29 showing for a 52-percent shooting night. At the half, the home team held the narrow advantage at 31-30. Off the tip, Georgia was the hotter team, jumping out to an 11-2 advantage. On the game’s opening possession, Claxton scored a layup, and then the next time down the floor, Wilridge grabbed an offensive rebound, and dished it to Jackson for a wide open three-pointer. The Razorbacks answered with a run of their own, tying it for the first time at 14-all. The first half had four more ties, including the last with 23 seconds left. Claxton, Jackson and Ogbeide each had seven points for the Bulldogs, while Arkansas’ Mason Jones had a game-high 15 points. The Razorbacks extended their lead to five three times in the opening five minutes of the second half, but back-to-back threes from Tyree Crump and Claxton gave Georgia its first lead of the second half at 41-40 with 13:47 on the clock. The game reached its sixth tie at the 12:55 mark and Arkansas broke it with a 10-3 run for a seven-point lead, 52-45. Fighting back for another tie, Georgia strung together seven-straight points off the hands of a Hammonds’ layup, Claxton free throws and a trey from Jackson. It wound up being the final tie as consecutive Arkansas threes reestablished the Razorback lead with 4:20 left in regulation. Ogbeide answered with a dunk to pull within four, 58-54, but the Georgia defense couldn’t formulate a stop and cash-in offensively down the stretch. The Bulldogs return to action at home against South Carolina Saturday, Feb. 2 at Stegeman Coliseum. Tip-off is scheduled for 1 p.m. ET and will be aired on SEC Network. They were laughable and very hard to watch if you enjoy watching a game played with even a modest level of competence. A team that I describe as square pegs attempting to fit into round holes. Hammonds should not be a starter because he lacks effort and is unreliable.